The North Florida Bicycle Club brings you a classic one-day bicycle event designed for all road cyclists, the 29th Annual Endless Summer Watermelon Ride. Enjoy a wonderful bike ride on scenic Amelia Island through historic, tree lined Fernandina Beach, along the ocean and south to the Talbot Island State Parks. Come check out the League of American Bicyclists’ 2013 Bronze Level award winner, Fernandina Beach. Take your pick of five routes: 20, 30, 53, 73 and 100 miles. We'll provide pre-ride snacks, rest stops stocked with food, water and Gatorade, marked routes, maps, mechanical support, SAGs, motorcycle safety escorts in Fernandina Beach, and a post-ride lunch. to guarantee your official event swag! Order your jersey by July 29th and it will be shipped to you before the event. All orders placed between July 30th and September 16th will be delivered to your address by October 28th. Please note: No refunds or exchanges on event jerseys where the size measure true to sizing table. Amelia Island is home to a variety of lodging options and sports a mix of prestigious national chain hotels near the start/finish location. Parking is available behind the Atlantic Recreation Center, at Main Beach and along Atlantic Ave. Do not park or attempt to drive through the start/finish area in the lot in front of the Recreation Center or on the west side of the Center. Follow the directions of the volunteers who will direct you to the lots. Do not park in the church lot just east of the Recreation Center. All 30, 53, 73 and 100 mile riders should line up according to the pace they expect to ride, with faster cyclists (23+ mph pace) up front and slower cyclists (12-14 mph) toward the back. Cyclists will be released at short intervals in groups of about fifty. Teams and groups of friends should be side-by-side at the start and request that the rope handlers keep you together. We will release 20 mile riders as a group at 7:50 am after longer distance riders have left. To make sure everyone gets to the finish in a safe and timely fashion, the Endless Summer Watermelon Ride has cut-off times. All riders should be off the road and finished by 4:30 PM as all support services end then. 103-mile (yellow) route-must leave Rest Stop #4-Dames Point-at 41-mile mark by 11:30 AM or return to finish via the 77-mile (blue) route. 53-mile (orange) route-must leave Rest Stop #2-Bridge West-at the 17.7-mile mark by 9:45 AM or return to finish via the 30-mile (green) route. Any rider behind the bicycle sweep for a specific route after the cut-off time, will no longer be a part of the ride and will not be supported. Endless Summer Watermelon Ride is an open course on public roads. Be cautious at all road crossings and obey all traffic signs and signals and police officers. Ride defensively. Don't assume motorists or other cyclists will do the right thing. Where present, Florida law requires you to ride in the bike lane, except to pass another rider or avoid an obstruction. The roads in both Fort Clinch are narrow and open to normal traffic including large RVs. Keep to the right and do not cross the centerline. On the Talbot Island bike trails keep right and be alert for two-way bicycle and pedestrian traffic. The speed limit on the wooden bridges on the bike trail is 10 mph. In pacelines with unfamiliar riders, be cautious and give yourself extra room. Cross railroad tracks at a 90 degree angle. 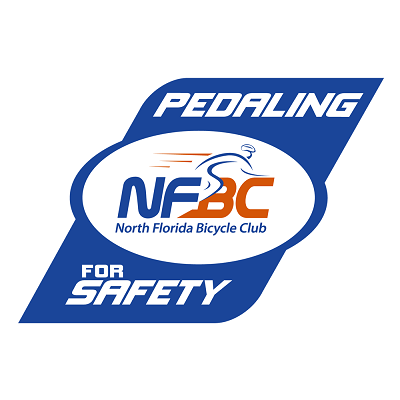 The ride will proceed rain or shine unless cancelled by NFBC for severe weather conditions. When you register for the ride, you will have the opportunity to purchase a Protection Policy in the event the ride is cancelled for weather or you are unable to attend for other covered reasons.